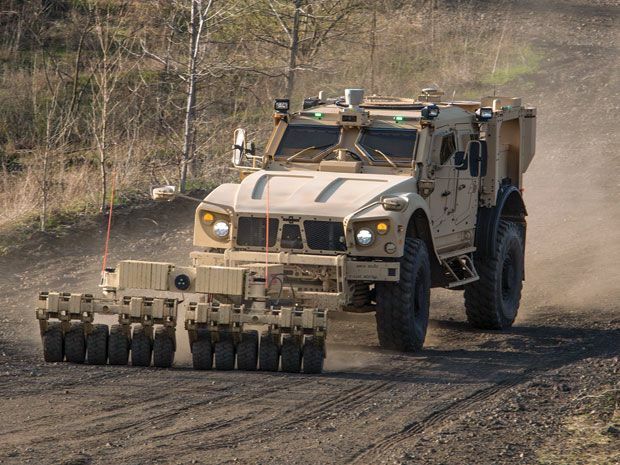 Oshkosh Defense has worked with both the U.S. Marines and Army to figure out how its TerraMax Unmanned Ground Vehicle could act as the vanguard or scout for manned military vehicles–using mine rollers and ground penetrating radar to detect and set off mines or improvised explosive devices(IEDs). In a worst-case scenario, the TerraMax minesweeper could take the brunt of roadside bomb explosions or ambushes and spare the human soldiers following behind in their own vehicles. Oshkosh recently showed off its vehicle’s capability to navigate courses simulating minesweeping missions at the Eurosatory 2014 defense exhibition held in Paris from June 16-20. Oshkosh Defense has refined the TerraMax’s self-driving capabilities since the vehicle participated in the U.S. military’s DARPA Urban Challenge in 2007, an urban race for robotic vehicles. The brains of the TerraMax UGV–a module containing both software and multiple sensors–could also work with other vehicles. Such technology could theoretically make any military vehicle into a robot capable of working tirelessly through darkness, dust, rain, and snow. The company also envisions its TerraMax robotic vehicles playing many different roles for the U.S. military in supply convoys, airfield construction, and similar operations. But the company is not alone in its race to sell robotic vehicles to the U.S. military. Defense giant Lockheed Martin has also demonstrated a similar autonomous system that can transform military supply trucks into self-driving vehicles. In the long run, the U.S. military could eventually have supply convoys consisting almost entirely of robotic vehicles such as minesweepers and supply trucks. That not only takes humans out of potential harm’s way, but it could also help the U.S. Army fulfill its vision of reducing the number of troops relegated to the logistics tail of military operations.